As an investor, you have access to dozens of tools that can help you secure and protect profits. And that’s the beauty of investing. If you know how to use those tools to play the game, you are set for success. That being said, most investors don’t know how to use these tools. In fact, many investors don’t even have a basic understanding of the tools that they can use to protect their long-term profits. But most investors don’t know how to use these tools. And this lack of knowledge can hurt their long-term profits. If you meandered onto this page, you are likely one of the smart investors who are looking to increase that knowledge. And today, I focus on one tool that will help you do so. It’s called a trailing stop loss. And it could serve as a wall between you and major losses. Over the course of this educational page, I tell you exactly what a trailing stop loss is, how it differs from a stop loss, and a few resources to help you execute a trailing stop loss through an online brokerage. In order to understand a trailing stop loss, you need to understand a stop loss. A stop loss is an order placed with a broker to sell a security at a certain price. Most investors associate stop-loss orders with long-term orders. But they also work with short orders. You just have to vary the strategy a bit. Stop-loss orders are a great way to avoid emotional investing. Instead of sitting there, fretting about whether to sell, you are locked into selling at a certain price. You also don’t have to monitor the stock constantly. But there are some shortcomings to stop losses. You see, if the stock surges and you have a stop order in place, you will sell at the price you've already set. This means that if you said to sell at $8, even if the stock surges to $16 and then falls to $7, you're stuck selling at $8. And, if the stock moves too dynamically, the sell could remain un-triggered. And this means that you could miss your sell order price. Now, what about trailing stop losses? A trailing stop loss is similar to a stop loss. But, unlike a stop loss, it provides you with more profit protection. You see, a trailing stop loss adjusts higher as the price of an asset rises, thus allowing the investor to lock in gains. Say you put $20 into a shoe company. You placed a trailing stop of 10% to protect yourself from losses. This trailing stop means that you will automatically sell the stock if it dips 10% below its high since you purchased it. If this were a simple stop loss, you would sell at $18. But because you placed a trailing stop, the stock can increase in price and you will sell higher. Now, say this shoe company was doing well. Its stock jumped up to $50 in value and then dipped 10%. You would sell at $45. So, you just protected all the profits you made on the stock. If you hadn’t placed a trailing stop loss, you would have sold the stock if it hit $18. This way, you get to keep a chunk of the profits instead of watching your investment fall around your ears, eventually selling at the bottom. Trailing stop losses are even more essential in today’s trading environment — where stocks can fluctuate dramatically. If investors buy stocks with only stop orders, they may miss out on rapid profits. 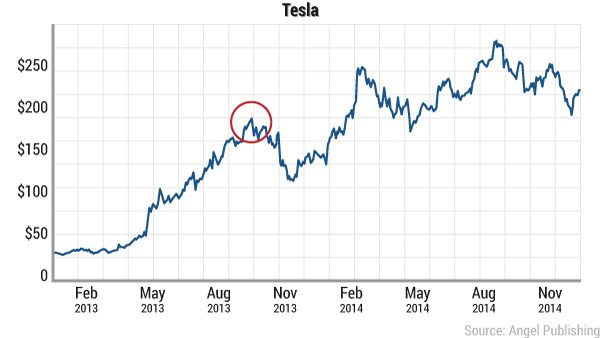 Say you bought 10 shares of Tesla (NASDAQ: TSLA) for $40 back in early 2013. Imagine that you saw CEO Elon Musk’s vision and thought the company would go big. At the same time, you were wary. The ideas presented by the fledgling CEO were ambitious. And you wanted to protect yourself in case the company proved incapable of delivering on its promises. Then, we hit mid-2014, and Tesla’s stock price went flying. In fact, your $400 investment was up by over 400%! And when Tesla hit $190, you would have been sitting on $1,900. Then, without warning, the stock started to dip. It was falling back toward $130. But luckily for you, your trailing stop order kicked in at around $171. You still walked away with nearly 400% gains. Some investors are quick to make a point. In this example, Tesla stock boomed again after the dip, so a trailing stop loss of 10% could have cut you from more profits down the line. An investor can always buy back into a stock after a trailing stop loss kicks in. But because you placed this stop, you are protected against the worst-case scenario — the stock going to $0. And here’s the best part: If the stock continues to go up, nothing happens. You get to keep making profits. And if the trailing loss isn’t triggered, you’re in the clear. However, if things do start going south, you are immediately protected from losing profits. If anything, this is the portion of trailing stops losses that investors struggle with. Grasping the underlying concepts is fairly easy. But figuring out how to place and execute trailing stop orders is harder. If you are working with a broker, then you can usually tell them exactly where you want a trailing stop to be placed when buying the stock. In general, this takes the process from your hands. However, if you are doing the process through an online broker, you get to be more hands-on. You can still place trailing stops on stocks when you buy online. And online brokerages like TD Ameritrade make the process fairly simple. So, now you're ready to get started. With this new tool, you can start protecting yourself from losses and lock in long-term gains. If you are curious about other investing tools, make sure to subscribe to our free Wealth Daily e-letter. We cover a wide range of investing topics every week, starting with basic investing and going all the way up to alternative investments like Bitcoin. Bank of America may be boring, but when I invest, I don't invest to be cool or flashy or smart; I invest to make money. Weekend Edition's Steve Christ takes a look at 16 ways any investors can improve their performance in any market. Wealth Daily editor Steve Christ explores stop/loss orders and why every investor ought to be using them as a part of their trading strategy. Wealth Daily editor Ian Cooper examines why it's not always smart to use just Bollinger Bands in technical research.